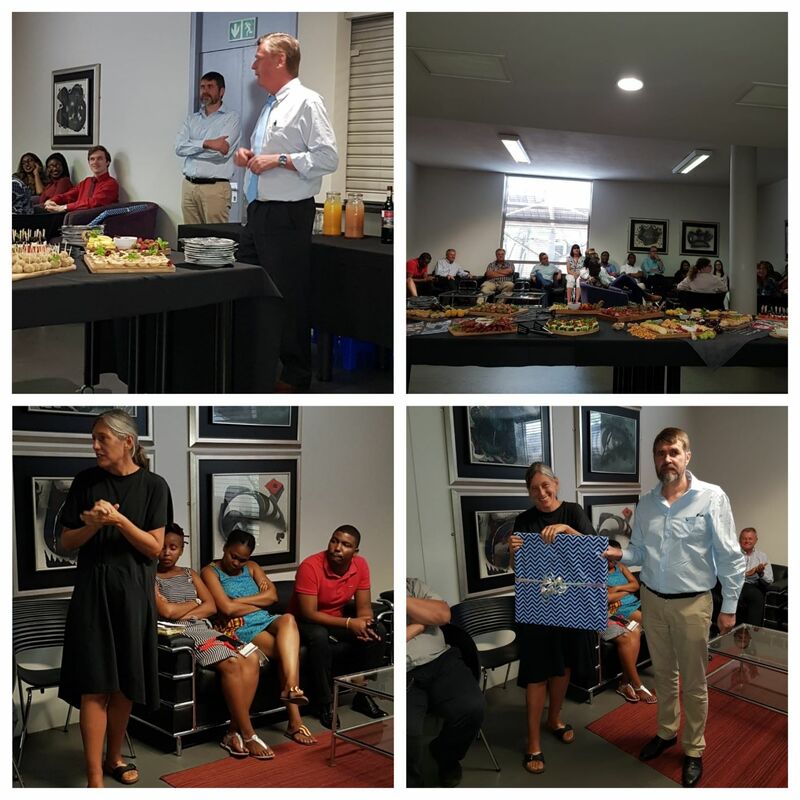 On 24 January 2019 the Faculty of Law at the University of Pretoria bid farewell to Prof Karin van Marle from its Department of Jurisprudence. Professor Van Marle joined the Department of Jurisprudence (then known as the Department of Legal History, Comparative Law and Legal Philosophy) as a senior lecturer in 1999 and left the services of the University of Pretoria at the end of January 2019. She was promoted to associate professor in 2002 and to full professor in 2004. From November 2007 to November 2008 she acted as Head of the Department of Jurisprudence whereafter she served two four-year terms as Head until November 2016. After the conclusion of her second term in 2016, she acted as Head of the Department of Jurisprudence until July 2017. She will join the Faculty of Law at the University of the Free State from 1 February 2019. Prof van Marle's teaching, postgraduate supervision and research fall within the broad field of law and the humanities and involves critical theory, legal philosophy and jurisprudence. The main focus of her research for the past two decades has been on the thinking of a post-apartheid jurisprudence, situated in themes of transformation, decolonisation, memory, reconciliation and reparation. Her research and writing on post-apartheid jurisprudence, inspired by and embedded in feminist theory, engages with the crisis of modernity and a rethinking of law and legal theory along the lines of fragility, finitude and a ‘giving up of certitudes’. Dean André Boraine and Prof Johann van der Westhuizen, Head of the Department of Jurisprudence, extended the Faculty's appreciation to Prof van Marle for her passionate contribution to the development of jurisprudence in UP and the Faculty over the past two decades. In return Prof van Marle expressed her appreciation for the valuable cameraderie from Jurisprudence staff in particular and the fondness for her students over the years, and the hope that teaching in the Faculty will be viewed as an opportunity to emancipate and empower students with the passion and knowledge to reflect on complex and conflicting issues from a variety of perspectives, but in particular from a phylosophical and socioeconomic perspective. ‘So long’, Professor van Marle. Our best wishes with your new position at the University of the Free State and life with your family in Bloemfontein. It is with profound sadness that the Department of Jurisprudence and the Faculty of Law at the University of Pretoria bids farewell to Professor Karin van Marle after 20 years of service at the institution. Professor van Marle will be relocating to Bloemfontein to take up a position as Professor in the Department of Public Law at the University of Free State, Law Faculty where she will continue to teach Legal Philosophy as well as Legal Interpretation. Professor van Marle is one of the vanguards of legal philosophy, critical jurisprudence and feminist legal theory in South Africa and is recognised internationally as a leading scholar in the field. Her academic career has been characterised by an unflinching commitment to a life of the mind, and to defending the value of thinking and reflection as attributes of a healthy society. She rose through the ranks of academia, starting in 1991 as an assistant in the University of Pretoria’s Department of Latin and then working as a junior researcher at UNISA’s Department of Public Law (1993-1996) and thereafter as Lecturer in the Department of Jurisprudence of the same university (1997-1999). She joined the Department of Jurisprudence (then known as the Department of Legal History, Comparative Law and Legal Philosophy) at the University of Pretoria on 1 February 1999 as Senior Lecturer. She was promoted to associate professor in 2002 and then to full professor in 2004. From November 2007 to November 2018, Karin acted as Head of Department (HoD) whereafter she served two full-terms as HoD until November 2016. After the conclusion of her term, she acted as HoD until July 2017. During her illustrious career at the University of Pretoria, Professor van Marle delivered many papers at national and international conferences, including as a plenary and keynote speaker. She has published 1 co-authored book, over 75 articles in academic journals and more than 30 book chapters. She has been a contributing editor to 6 edited collections as well as a number of journal special issues. As a postgraduate supervisor over the years, she has delivered countless LLM mini-dissertations, over 20 LLM Research students and 14 LLD and PhD students – with a handful more due to graduate in the 2019 academic year. Today a number of her doctoral students are prominent academics, researchers and professors across South African universities and research institutes. Her prolific and influential body of scholarship encompasses vast intellectual and theoretical landscapes. Her research weaves together an interest in the development of an ethical approach to equality; in law and the politics of interpretation; democracy, community and the public sphere; transformative and memorial constitutionalism; transition, memory and the archive; reparation and reconciliation; post-apartheid feminist jurisprudence; critical legal education and more recently spatiality; modernity and epistemic justice. Her writings are a patchwork of multiple perspectives and voices and examines law and politics from a philosophical, literary and aesthetic angle. Underlying the many strands of her research and teaching are the notion of ethical feminism and the relationship between law and the humanities. The central question animating her scholarship pertains to jurisprudence in the aftermath of apartheid as well as the role and limits of law in South Africa’s struggle to transform. Professor van Marle’s academic networks reach across South African Universities to the UK (where she has been closely associated with the Critical Legal Conference and Birkbeck Law School, University of London among others), Australia, the United States and Canada. In addition to being awarded a number of research and visiting fellowships, she has held a fellowship at the Stellenbosch Institute for Advanced Studies (STIAS) where she led a number of collaborative research projects with an international group of scholars. As further testament to her scholarly standing, she is also a two-time recipient of the University of Pretoria’s Exceptional Researcher Award. She sits on the editorial board of two international journals, Law & Critique and Feminist Legal Studies and is the editor of the Faculty’s in-house occasional papers series PULP FICTIONS. During her nearly decade-long leadership of the Department of Jurisprudence, Professor van Marle spearheaded the process of not only renaming the Department but reconceptualising its teaching and research mission to incorporate social, historical and political context, interdisciplinarity and greater focus on writing and research skills. Under her leadership, the profile and productivity of the Department grew considerably. The Department played a key role in the hosting of the annual Ubuntu conferences as well seminars/colloquia on women and the law, poverty and justice, and land among many others. In addition to her role as HoD, she also served as the Faculty of Law’s Research Co-ordinator from 2009 to 2014 and as Acting Director of the then ‘Institute of Women’s and Gender Studies’ from 2004 to 2005. The Faculty of Law and Department of Jurisprudence has benefitted immensely from Professor’s van Marle’s principle, passion and vision. She will be greatly missed by her friends and colleagues, who also know her to be a brilliant cook and Leonard Cohen fan. We wish her the very best on this new journey.